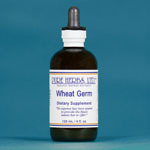 Wheat Germ - Helps to support a healthy respiratory system. * Triticun aestirum. Parts used: sprouting part of the plant. WHEAT GERM - Contains the entire complex of vitamins known collectively as Vitamin E. Fresh, sweet wheat grain hearts are a prime source of Vitamin E and protein. Vitamin E is vital for the function of heart and lungs, and well known as a life extender. 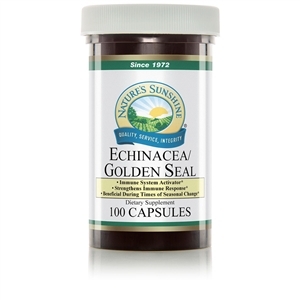 The function of strengthening the longitudinal muscles of the body is a specialty of this complex of vitamins. Hence, its importance in repairing and preventing ruptures, and strengthening and or repairing muscles, such as the heart muscle. If an eye(s) is crossed then apply Vitamin E liberally to the sides of the nose, under the eyes and on the temples, 3 times per day, until the muscle tone is normal and the eye(s) are held straight in position. There is a fairly well founded theory that the degenerative aging process is caused by a group of poison oxygen compounds called free radicals. Free radicals are formed in the body's process of living, and poison the body. It is important to neutralize them. Free radicals are also put into the environment from manufacturing processes, insecticides and pesticides on plants and animals used as food, cleaning fluids, chemical additives to foods and from exposure to x-rays and radiation. Vitamin E neutralizes free radicals. In this day and time, it makes good sense to use Vitamin E as a daily supplement. If a person is moving to a mountain environment, it can help greatly, to prevent exhaustion and a host of problems, to include extra Vitamin E in the diet. It is well established that Vitamin E prevents near-sightedness in babies, if mother takes sufficient Vitamin E while pregnant. This is especially important for some Asian societies where whole populations may have a problem with this dietary deficiency, as evidenced by the too prevalent problem of myopia (near-sightedness). With regard to normal continuing sexual function and fertility, Vitamin E is essential for both men and women. For women in later child bearing age, there is good evidence of preventing chromosomal problems and resulting birth defects, if ample Vitamin E is taken on a regular basis, and in increased amounts during pregnancy. Wheat Germ Extract also contains all the natural correlative factors (related supporting substances) which support Vitamin E Complex in a stabilized form and make it efficient, as nature intended. * DOSE:40 to 1 tsp., 3 times per day, depending on the need. Broad Beans Extract 4 fl. oz.